Got a favourite book or author you want us to review? Author's have a new book they want to shout about and indie authors that want a foot on the ladder, get in touch! You can contact us by messaging us on the comments of a page, or by using our contact form on the contact page. You can also get in touch via our Fagebook page here. John Wyndham Parkes Lucas Beynon Harris (wow that is a lot of names!) is an early science fiction author of extreme brilliance. Famous for works such as Day of The Triffids, The Kraken Wakes and The Midwich Cuckoos, many of his books have also been televised or filmed. Many people (at least people my age!) 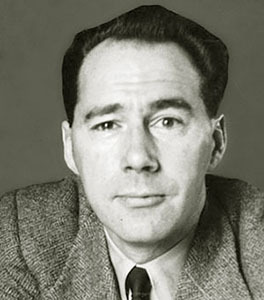 will have first met John Wyndham during school especially in the UK as he was an English writer. His book the Midwich Cuckoos was televised as The Village of the Damned (twice). He was also known as John Beynon and Lucas Parkes but was most famous as John Wyndham. John Wyndham. Photo Courtesy of Wikipedia. The thing about John Wyndham is that his writing was so ground breaking of its time that a lot of the things he wrote about back then are still so relevant today. Some things are not different and some things have changed dramatically and it is very interesting to compare the things that were either normal or abnormal back then by today's standards. Wyndham was writing at a time when women were struggling even more than today to be seen and heard as separate individuals and his ability to portray them as people of use and intelligence, to even acknowledge that the way women were treated was wrong is an incredible thing to see. It gives us a sneak preview into the days of yesteryear, their lives and struggles and most importantly the things they thought were possible. I really like this author, at this stage I am only including the writers that I read so for the most part it will always be positive. Having said that, these books I must have read 10 times each at least since childhood. I still go back to them, now and again and am often griping about the facts the some of his books that I own are falling part due to age and overuse. The good news is I have them all and have read them often, so don't forget to pop over to the Facebook Page if you want to chat about them, or you can leave a comment in the box below.